The 2017 Winter Classic is just days away when the Blackhawks––playing in their 104,309,257th outdoor game––will visit Busch Stadium to take on the Blues. The rink build is well underway, and Nelly (yes, that Nelly) will be there, so you know it’s going to be a party. Now that we’re in the home stretch of 2016, masks for the big game are all rolling out, so check out the breakdowns of each of them below. 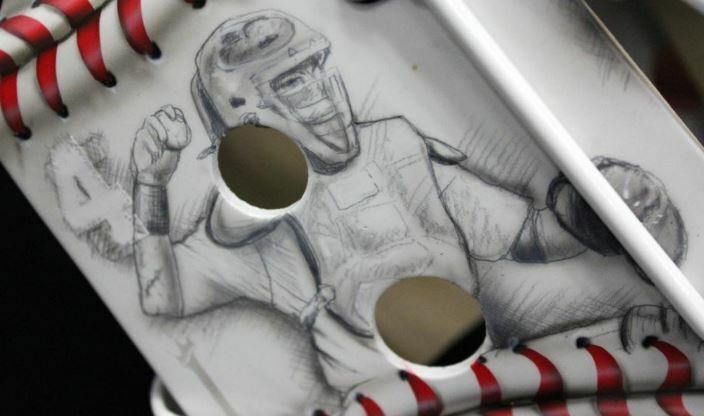 An early candidate for the ultimate troll job of the 2017 Winter Classic, Illinois-native Scott Darling is bringing the World Series champion Cubs with him to Busch Stadium in the form of not one, but two masks. The first (left), described by airbrush wizard Dave Gunnarsson as “Scott’s love story to the Cubs,” features current Cubbies Anthony Rizzo (Darling’s favorite player) and Kris Bryant as well as the late legendary broadcaster, Harry Caray. The top of the mask has baseball laces so realistic it’s as if the mask was stitched up itself, and the lone bit of color makes an appearance again around the chin and on to the left side in Blackhawks’ red, white and black stripes. The second (right), while consistent in theme couldn’t be more different, says Gunnarsson. “The design is created in a total different way than the first one. 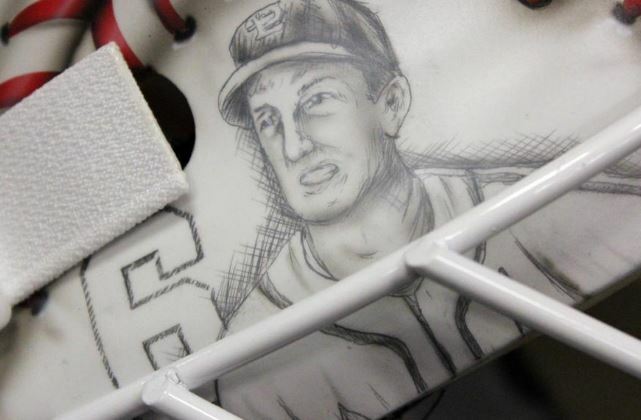 The design has focus on Scott’s favorite player, Anthony Rizzo,” the artist shared on Instagram. The process was a technique close to Gunnarsson’s heart, drawn primarily with a sketch pen to give the mask a hand-drawn effect. 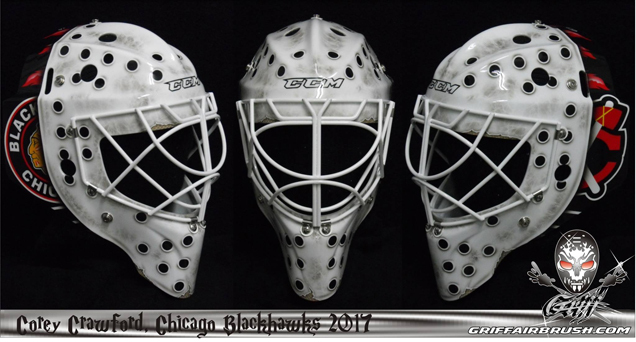 Gunnarsson drew portraits of Rizzo throughout the top of the mask along with the Wrigley marquee and Cubs and Blackhawks logos. 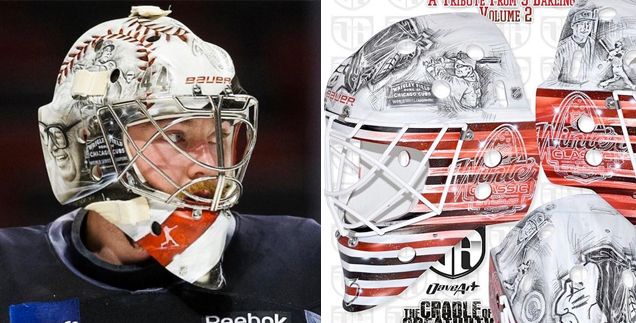 Can’t say whether St. Louis fans will take a shine to these masks or not, but Darling and Gunnarsson for sure made the Chicago crowd proud with these two designs. With a look we haven’t yet seen for Corey Crawford, artist Stephane Bergeron created an awesome old school design for Crawford’s six hundredth outdoor game. Ok, that was an exaggeration, but with how many outdoor contests the Blackhawks have played in as of late, one would imagine that a goaltender and artist duo could get stumped for fresh ideas––but not these two. Playing off the new-mask-as-an-old-mask look that we’ve seen others use for outdoor games, Bergeron took a slightly different approach, opting for inanimate logos in the negative space rather than the hair and ears that have become a sort of trend. 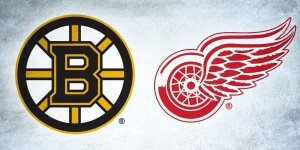 With most of the mask being void of any color or team branding, it’s a nice touch to tie in the history of the franchise in a subtle way. Even the large white areas in this mask are full of impeccable detail, from the weathering and cracked texture to the “torn” areas around the edges, every inch of this mask was thoughtfully designed and skilfully executed, resulting in a beautiful final product. 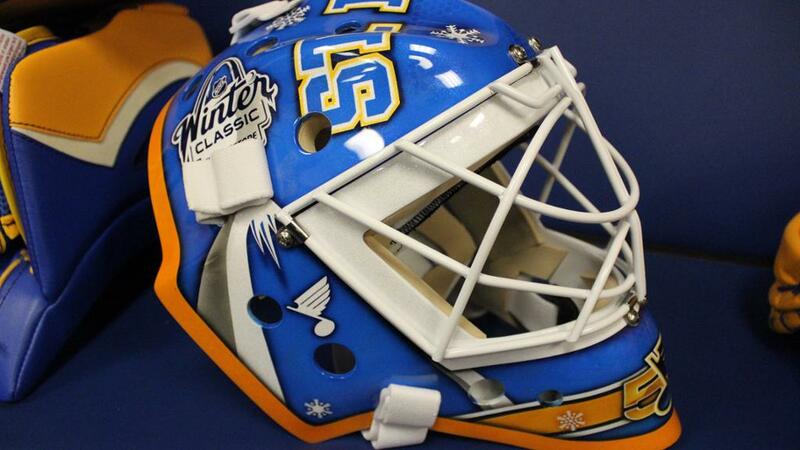 Designed by Dennis Simone and painted by Allen’s regular artist Jason Livery, the bold mask features the icicle-covered Gateway arch on each side and Blues’ 50th anniversary logo on the chin, all in the team’s classic blue and gold color palette. White snowflakes and musical notes are dispersed throughout the mask with “St. Louis” in varsity-style lettering across the top. The best part of this design, however, is the spot-on coordination with Allen’s pads for the ‘Classic, making for one phenomenal complete 60’s getup. This one will surely be groovy to watch take the ice at Busch Stadium. 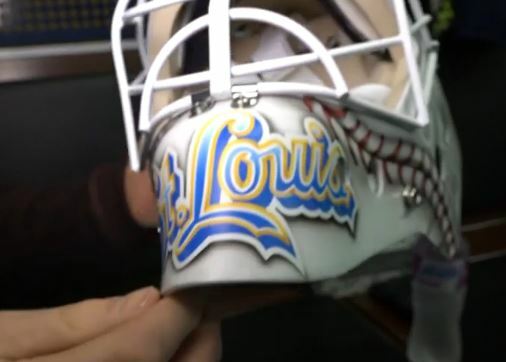 Countering Darling’s Cubs-theme bucket and playing to the hometown crowd is Carter Hutton’s incredible Cardinals mask. 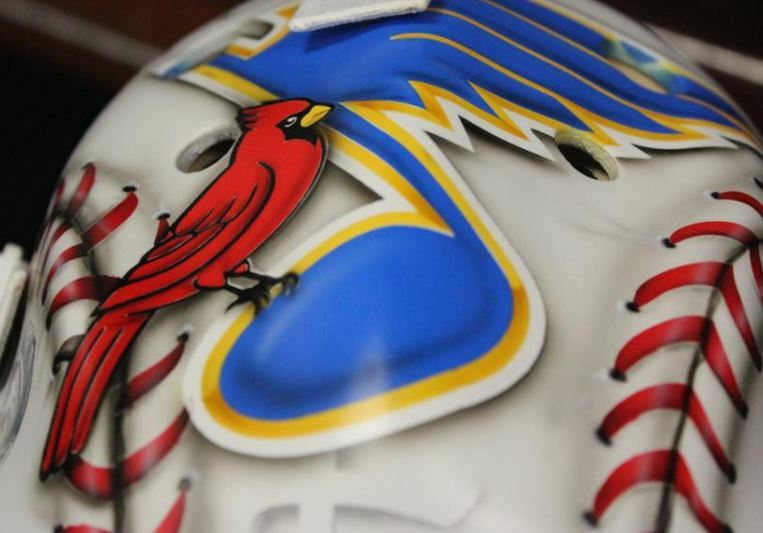 “I thought I would do something that’s a tribute to the Cardinals,” Hutton told NHL.com, “especially since we’re playing at Busch Stadium and having an outdoor game there, it makes sense.” A UMass Lowell alum, Hutton worked with his regular painter, Wilmington, Massachusetts artist Jesse Acciacca, to put together the design. 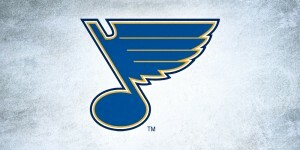 “We’ve got the Blue note with the Cardinal on there,” the netminder shared during the reveal. 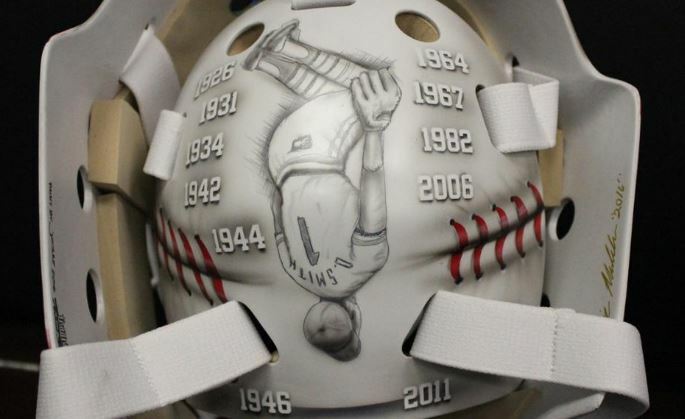 “On top of that we just kind of did a tribute to a bunch of players who have played for the Cardinals.” The likes of Stan Musial and Yadier Molina make appearances in sketch pen portraits around the mask, as well as Ozzie Smith’s iconic backflip depicted on the backplate surrounded by the years of the Cardinals’ World Series titles. Similar to Darling’s mask, red baseball laces add movement and color throughout the design, finished off with the Cardinals’ “St. Louis” wordmark on the chin in Blues colors. 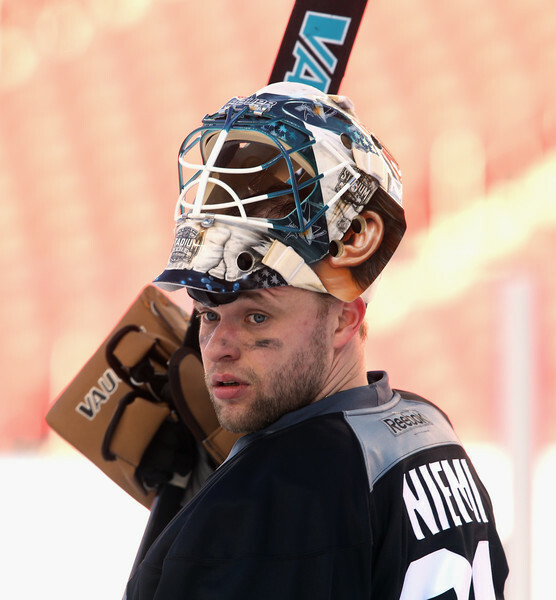 What do you think of this year’s Winter Classic masks? Let us know in the comments, or on Twitter or Facebook! Hmmm. 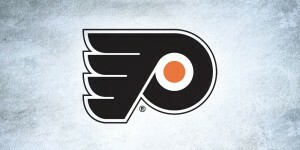 At first glance, I thought those were bullets holes on Crawford’s mask. Might not go over too well in Chicago. 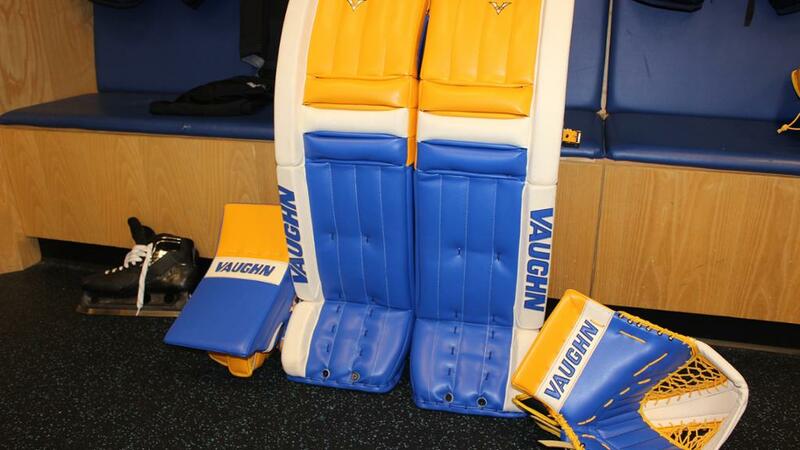 I know this is a late post, but Carter Hutton’s mask is THE BOMB!!! I want one of those!!! !